The Marked Ones is the fifth Paranormal Activity film, the latest in a series that’s seemingly unstoppable. The reason for the series’ longevity isn’t complicated; people (especially teenagers) love to be scared. These films are primarily a vehicle for frightening its audience, and The Marked Ones is very much in that tradition. It eschews the static cameras that defined its predecessors but – aside from Hispanic protagonists as opposed to lily-white ones – it’s utterly conventional. Found footage with jump scares, possession tropes and a dash of Chronicle for good measure. The important question remains – is it scary? If the moans of dread and screams of terror in my packed screening were anything to go by, it’s at the very least adequate. It’s certainly an improvement on the disappointing third sequel, which got tangled in its own mythology and pretty much forgot about providing interesting characters or effective scares. The Marked Ones is fortunately less interested in reinforcing the series’ convoluted and, frankly, silly mythology; it isn’t until halfway through the film that an explicit link is made between the events on display and the earlier films. While I’m not going to herald the first few Paranormal Activity films as masterpieces, genre or otherwise, I have some respect for the films. I don’t think criticism of the films is unwarranted: the aesthetic ensures that the cinematography is uniquely unmemorable, and means character development is slim to none (turning into a demon: not actually character development). They operate reasonably well as scare factories, using negative space and stillness to create fear in the mind’s eye rather than on the screen; effective horror comes from within, after all. The reason I have more time for these films than most critics is the way their bare bones stories act as a prism for more meaningful themes. If I’m honest, I’m pretty sure these themes are almost entirely accidental; these films are more product than art. Nonetheless, there are these little resonances that slip through these commercialist cogs. The original Paranormal Activity’s bump in the night scares suggest the more plausible and chilling possibility of home invasion but, more significantly, it also evokes the sense of dissociation in unhappy relationships. The most powerful moment in that film is Katie’s disconnected not-speech when Micah finds her outside, practically catatonic. The third film, on the other hand, suggests familial abuse without making it the focal point of the narrative. One common feature of all Paranormal Activity films is that trying to make contact with the supernatural is a really bad idea. Every movie sees the protagonists try to reach out with a Ouija board or similar (in an odd touch, the conduit to the other side in The Marked Ones is a faulty electronic “Simon” game), and invariably that’s the point when things go from bad to worse. At first I thought that this film was going to tie that in to a problematic metaphor about not interfering with your neighbour’s domestic drama. Thankfully that plot thread is quickly (and violently) abandoned and the script changes gears. The Marked Ones ends up finding a different way to flesh out the concept that making contact isn’t always a good thing. Main character Jesse (Andrew Jacobs) finds himself with a titular mark, wakes up with apparently supernatural powers but soon becomes moody, violent and altogether creepy. It’s not hard to see the links between his intertwined assertiveness and aggression and the gang members who populated the margins of the movie; whether deliberately or not, Jesse’s experience can be read as a metaphor for a young man embracing gang culture: tattoos, rites of passage, even drugs – the scenes where Jesse’s family tries to exorcise him are eerily reminiscent of an addict going cold turkey. Unfortunately, none of this really gets tied in substantially to the plot, which reinforces the assumption that this is all a happy accident rather than a conscious decision by director and screenwriter Christopher Landon. The Marked Ones builds to a near-incoherent conclusion designed to march audiences out of the cinema in a stunned daze; I was simply disappointed. 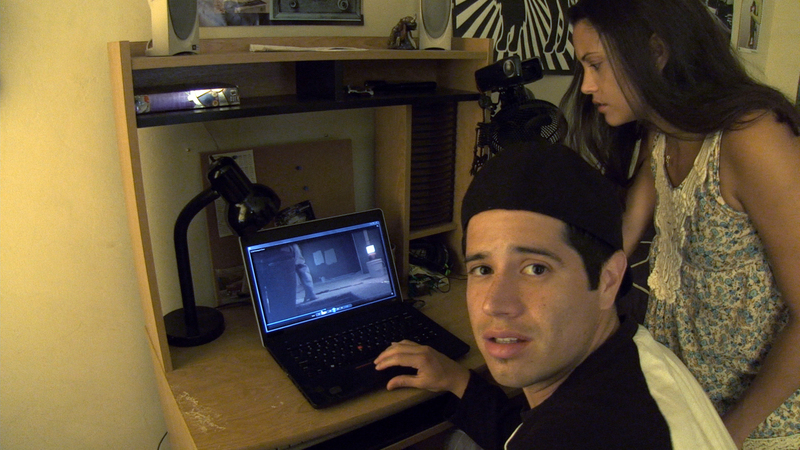 Perhaps underwhelming endings and abandoned themes are simply a hallmark of the Paranormal Activity series. Paranormal Activity: The Marked Ones is a forgettable film. But maybe that’s the point. Teenagers will flock to the cinema, spray popcorn over the floor in gleeful fear, and never think about it again. There are worse ways to spend ninety minutes. Good review Dave. Not a terrible movie, but definitely the worst of the franchise and shows that the wheels may be slowing-down on this story. I liked this one pretty well. It may have been the best one since part 1. But I actually have liked each installment. I don’t understand why so many are so down on part 4. I understand it raised more questions than provided answers, but that’s okay since the franchise isn’t finished. Had it been the final installment I would understand the frustration. Each installment provides some genuinely creepy moments and most horror films fail in this area, therefore I am satisfied with this franchise. Man, I dunno, I hated number four. The mythology just felt lke it was deliberately over-complicated without any real purpose and it was utterly bereft of scares for me. Way too many scenes where essentially nothing happened. I don’t mind the other three films, as I said, but I can’t imagine watching number four again personally! I think the lack of scares in part 4 was to psych-out the audience and throw you off. I think it worked b/c if your brain is expecting one thing to happen (a scare) and then something else happens (nothing) then you just had an experience whether you realize it or not. When you brace yourself for a scare but then don’t get it, it’s still just as effective, maybe even more effective, then if there was an actual scare. I thought that was the genius and fun of part 4. You never really knew what was coming. Well, you seem to be in the large majority to those who hate it. I’m definitely in the minority, but I liked it. I thought Alex and her boyfriend poking fun of Robbie’s mannerisms thru the window (scene in the first act) was hilarious. And that end scene w/ Katie in the hall crept me the heck out. Not something I’m particularly interested in, but nice review nonetheless mate. Nice review Dave! I’m a big defender of the first movie. It’s very tense and great with physical space, like you say, audience is always scanning the screen. I gave up on the series as it went on (3 was my last), but I guess there’s a bit more going on with these than say endless Saw sequels. Love your interpretation of the first movie being about relationships, really makes it work on another level! Thanks! 3 was probably a good place to stop (I actually like that film more than the first; I found the climax genuinely scary and I thought they used the fan gimmick very well, even acknowledging that it’s just a gimmick). I mean, these films are just pulp from the filmmaker’s mill, but they’re more interesting than another lukewarm Apatow-esque comedy or whatever, even if they don’t really succeed as art.